Verse of your choosing hand stamped on a 7/8″ disc. The edges can be lightly hammered for a lovely textured look. Includes a cross charm and cultured pearl, but can be changed to your preference. Please include your scripture reference in the Word Inscription box below. Please select the number of add-ons you have chosen for your product. Extra Beads ($2.00) This must be a number! Extra Bead & Charm ($4.00) This must be a number! Stamped Ring ($5.00) This must be a number! Extra Charms ($2.00) This must be a number! Extra Stamped Bar ($12.00) This must be a number! Extra Stamped Disk ($12.00) This must be a number! 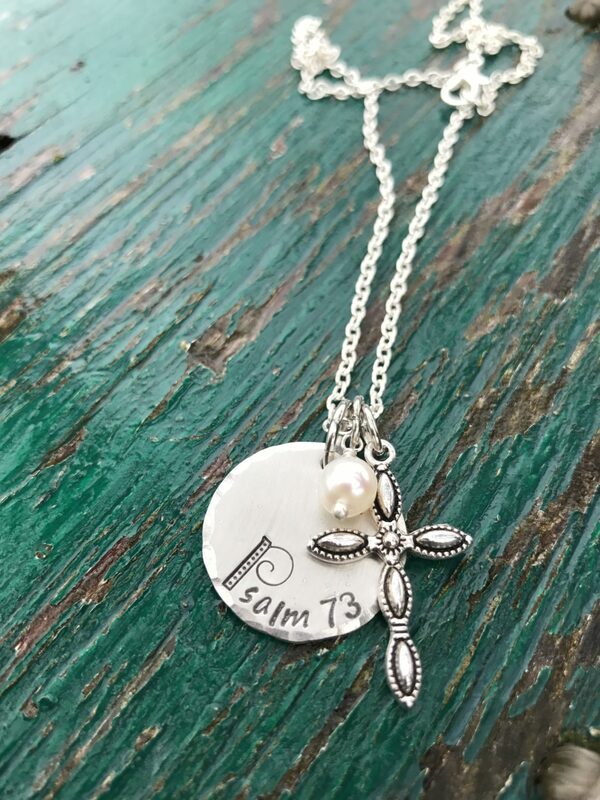 ✤ Each piece of jewelry is hand stamped one letter at a time making each piece unique and original, no two are exactly alike. ✤ Each piece comes tucked in a cloth drawstring bag ready for gift-giving. ✤ Cate welcome custom orders; please email Cate at cateflorey@icloud.com for inquiries. ✤ Created in her farm studio in the Pacific North West, Cate crafts each and every piece of jewelry by hand.